Join us at St. Margaret Mary on Sunday, March 17, 2019 at 3:15 in the Hospitality Room for an afternoon with Drs. Tony Sheppard and ZachThieneman. The topic will cover prevalent issues which are leading to a society of SAD children. (Children and teens who are suffering from Stress, Anxiety and Depression along with other mental health issues.) Hear ways to be supported and to support your children or their classmates. How to recognize the signs will also be part of the discussion. The founder of Groupworks, Dr. Tony L. Sheppard, Psy.D., CGP, FAGPA Licensed Psychologist (KY/IN)/Certified Group Psychotherapist, Chair, International Board for Certification of Group Psychotherapists and Dr. Zach Thieneman Psy.D., CGP-Assistant Director will be leading the discussions. 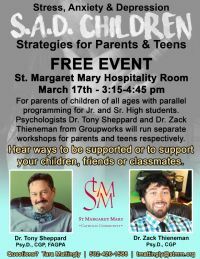 Dr. Tony Sheppard will be speaking with parents of children of all ages from adolescence to high school age while at the same time, Dr. Zach Thieneman will be leading discussions with the teens from 7th grade through high school age. Mass will follow at 5PM for all those whom would like to stay afterwards.